I've mentioned a few times in the past that 1) I used to do all this through a thread on Warseer, and 2) I had intended to enter a bunch of models into the 2010 Golden Demons in Baltimore, MD but ran out of time to the birth of one of my children. This model fits into both categories as he has previously been shown on the old Warseer thread and was intended to be finished for Golden Demon 2010 but was not done in time so I entered the test model I had done for him instead (which was a runner up!). Well, I decided that it was time for him to fulfill his destiny and actually be entered into a painting contest. Mainly because I found out about a very large painting contest that is just down the road from me! 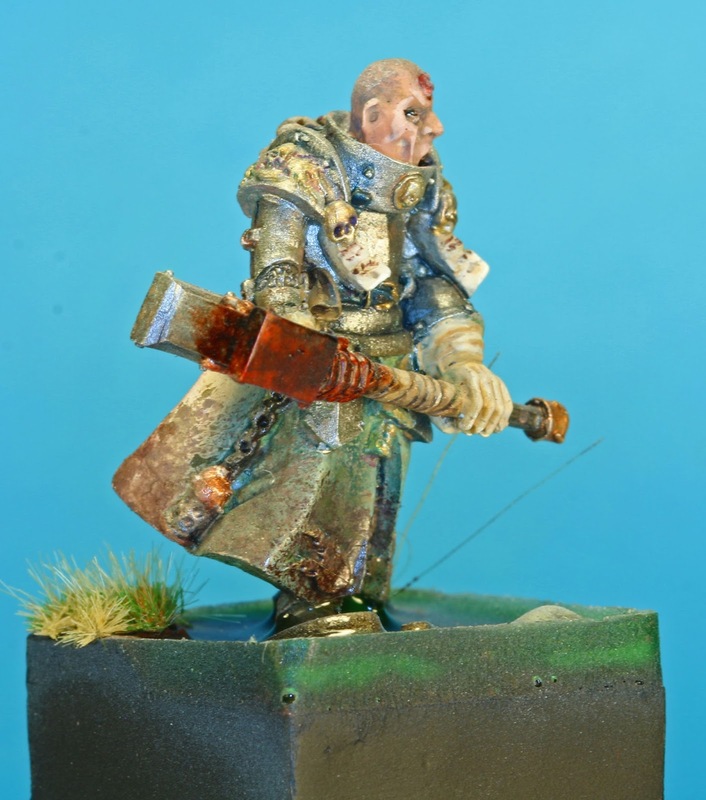 I entered him into the 2017 NOVA Open's Capital Palette contest. And a big thanks to Rushputin at the warpstonepile for picking him up for me! He didn't place, but I didn't expect him to. When I finished him, I rushed it because I was sick of looking at a half painted miniature for 2 or 3 years! And you can see where the rush and the boredom affected the quality. 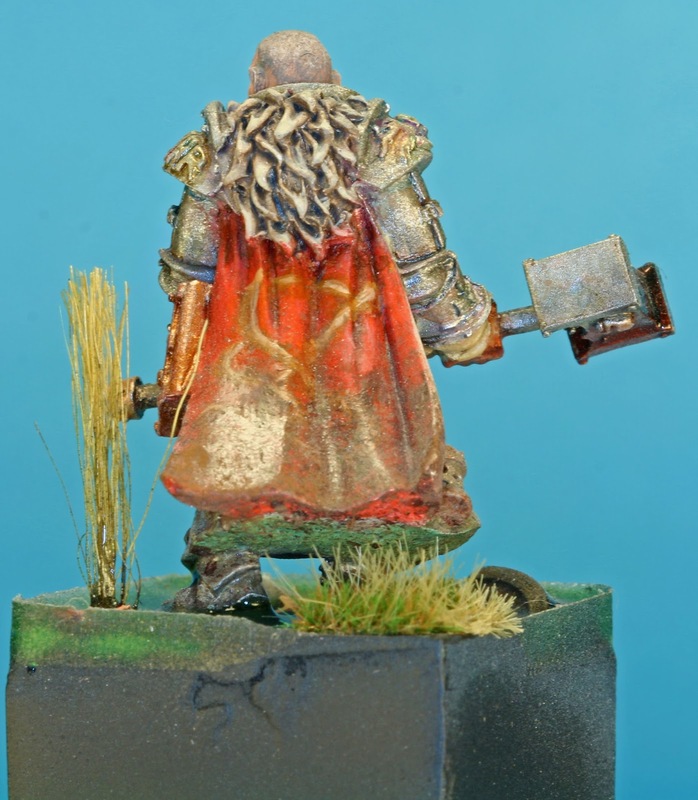 The metallics lack enough contrast and the lines of the freehand on the cape are way too thin. The display base also looks a little funny because my dam wasn't secure when I pored the water and I had to sand it and repaint it with the model still attached! All that said, I'm still pretty happy with how he turned out and I learned a lot doing him. 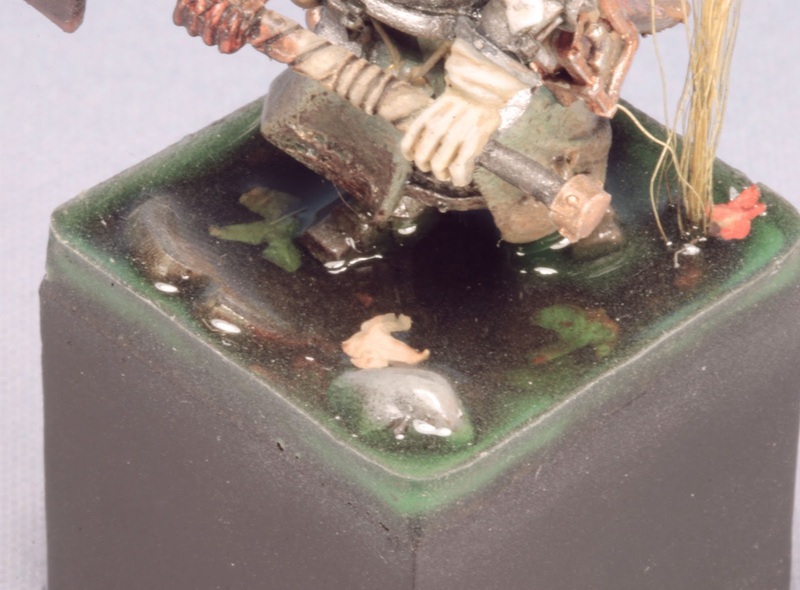 He was one of the first models I've done that is attempting to tell a story, specifically of a Sigmarite priest chasing his quarry into the swamp. It's a cool looking figure. I like what you did with the base, but I prefer playable bases to display bases. Thanks, but for competition models, gaming bases often look out of place and are a bit restrictive. My goodness, Andrew, but he is gorgeous! There are so many memorable elements: the pattern on his cloak, the expression on his face, and the subtle variegation in the metals, to name the most impressive. There's a lot of subtlety going on here, which is normally a strength of yours (dat Nicodemus is gorgeous, for example), but here there does seem to be a blandness, as you put it. I'd like to see some of that red on the front somewhere, I think. 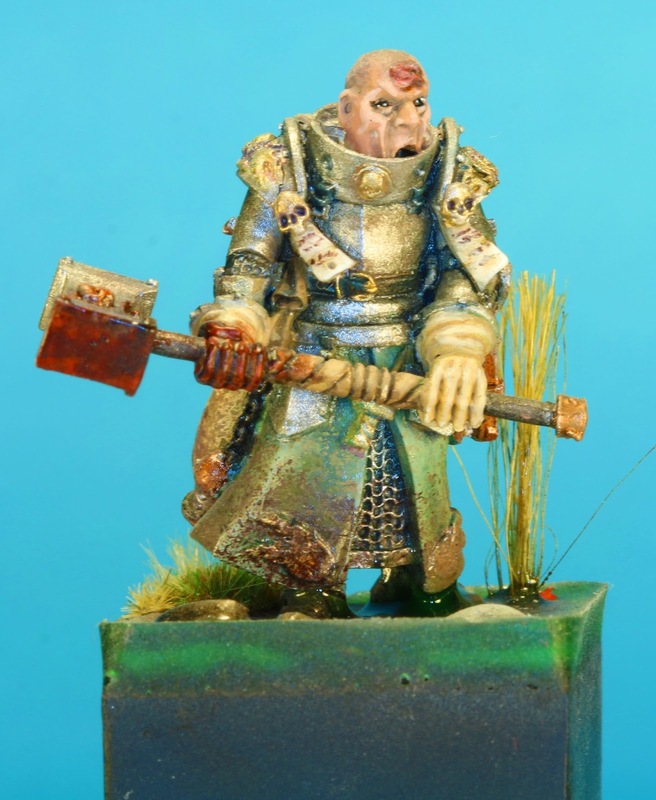 But a great piece nonetheless :D makes me itch to paint an armoured warrior priest too! Yea, the blandness (and the armor) are what I dislike the most. Stronger contrast in the shading and highlighting would have helped a lot. The contrast of red is a good idea too. C'est la vie! Mate, even though it didn't place, i think it's still an impressive painting effort.